Now, Terraria has one more thing in common with Minecraft: an overwhelming amount of success for an indie title. Since Terraria's launch on May 16, the game has been downloaded 200,000 times on Steam. Through word-of-mouth, media coverage and a Twitter shout-out from Minecraft creator Notch, the game has already acquired a dedicated fan base. Every day, Terraria Online's forum fills up with fan posts that celebrate the game with compliments, guides and fan art. "It's been such an exciting ride here. You've all helped build a great, huge community here dating back well before pre-release," the developer wrote in a statement to the community. "All of your suggestions have helped make Terraria the game it is today, and what a great game it is! We're all hoping for amazing future patches and further community growth here at Terraria Online." Some say Terraria is piggybacking on Minecraft's success, as the similarities between the two are immediately apparent. 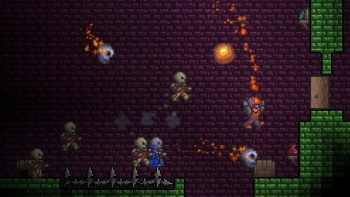 Both games feature randomly generated worlds, monsters that come out at night, destructible environments and a focus on gathering resources and building fortresses, above and below the surface. However, Terraria is unique in its 2D-perspective and focus on fighting and exploration, rather than appealing solely to the Lego-lover who wants only to build. It's also unique in finding an audience so quickly, where many other Minecraft-inspired indie games have failed.